with their huge old Plane trees. Celia and I met when we cycled 7,200 km across the country with Tour du Canada in 1997. 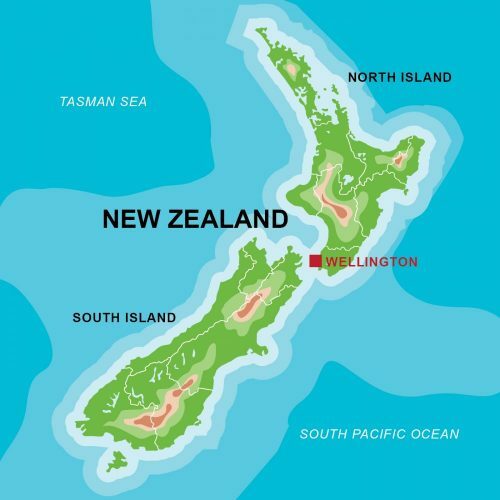 We then lived in Port Hope, Ontario for 5 years before moving to Hamilton, New Zealand (Celia’s homeland) and where we have continued our enjoyment of cycling for touring and for transport. I joined the CKAP programme in 2008, recording my daily cycling distances and continue to do this as an incentive to match or exceed my previous year’s total. Celia hasn’t joined CKAP as she doesn’t have the required odometer but she uses the system to record her cycling kilometres. She says if she has gizmos she will lose her ability to estimate distances, speeds, the time of day, direction travelling, etc., which she can do amazingly accurately. In October last year Celia turned 60 (‘how did that happen?” she asked!) To mark the occasion she wanted to do something special, particularly after having a major health scare. Towards the end of 2016 she started having some niggles and couldn’t get comfortable sleeping. Her stomach started feeling bloated after eating and she found she couldn’t eat much at one time. When we went camping before Christmas she just thought she wasn’t up to sleeping on an air mattress any more but when the discomfort continued well after meal time she knew something wasn’t right and decided to go to her GP. Exactly a month later, after blood tests, scans and a bone marrow biopsy, she was diagnosed with blood cancer – more specifically Splenic Marginal Zone Lymphoma. This explained her discomfort as her spleen was overloaded with the cancer cells and had expanded to about double normal size! Luckily she was able to start having treatment about 2 weeks later. Fortunately the treatment worked and by the end of June 2017 the cancer was found to be in remission and her monthly blood tests have shown this has continued since. Although there were still a few downs and it took time to build up her strength and fitness again, at the beginning of last year she was starting to think what she might do to make her 60th memorable and significant. It seemed there should be a challenge, probably some cycling and perhaps she could fundraise for LBC (Leukaemia and Blood Cancer NZ) as we remembered the great support that had been offered to us (as well of course from family and friends and medical staff). Her ideas went on the backburner twice during the year. Because of her reduced immunity, she was struck by pneumonia and later came down with a sinus infection and bronchitis! Fortunately I also got it so she was able to bounce back and be nurse for me! Although now she realised she may not be invincible, she felt fortunate to have good health and fitness again. So she took on her challenge – to ride 600kms during October with a goal to raise $2000 for LBC. 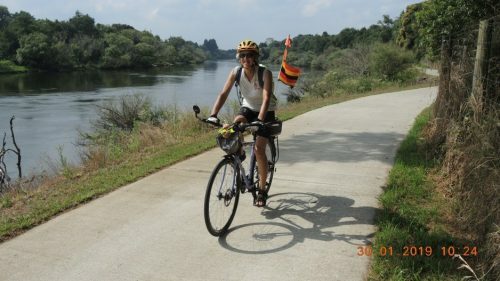 We set up a fundraising page, e-mailed family and friends and on 1 October, which happened to be the start of her 2 week teaching break, she set off for her first 60 kilometres, a ride to Ngaruawahia much of it along Te Awa – the river ride by the Waikato River https://www.te-awa.org.nz/ . 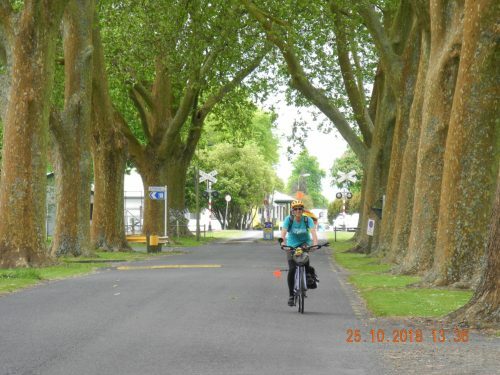 Although she went away for a few days to Christchurch for a family get together, she cycled all the other days of her holiday to accumulate 328km. She knew it would be more difficult to get enough kilometres once she started teaching 4 mornings a week again so instead of just doing the 11km to work and back she decided to take a ‘long way home’ to make it 21km. With these rides on her work days and some longer ones on her days off, she reached her goal a few days before the end of October. However, there was no stopping yet; she was further energised by the accumulating sponsorship which had gone well beyond the $2,000 goal to $3,805! So her final kilometres for the month totalled 702km. For the year 2018, she also accumulated her previously normal annual 6,000 km. While being aware that her cancer is in remission, not cured, she approaches each day with vim and vigour, loving her life and work and looks forward to our planned trip to the UK to cycle along Hadrian’s Wall and up the coast to Edinburgh in September 2019. Do you have an article you would like to share with CKAP? Please contact CKAP Support or CKAP Coordinator and we’ll publish it here! Improve your health and lifestyle: Join CKAP! (1) Te Awa (River Path) caters to people of all ages and abilities and was designed for both cyclists and pedestrians. The path is generally flat but does include a couple of very short but steep hills. The newest section is 10 km long running from North Hamilton to Ngarawahia.